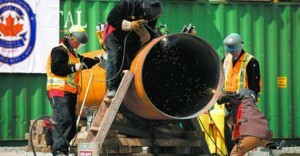 The North American pipefitters union and TransCanada Corporation have joined forces to launched a unique training program that will prepare workers fo r upcoming projects across Canada by teaching them to use the most modern welding technology. “They’ll be able to practice on 42-inch pipe, which no one can lay their hands on. It’s a major donation,” said John Telford, Director of Canadian Affairs for the United Association of Journeymen and Apprentices of the Plumbing and Pipe Fitting Industry of the United States and Canada (UA). TransCanada, and the company’s Energy East Pipeline Project team, donated 24 sections of 42″-diameter heavy-wall steel pipe that will be used for cutting and welding practice by hundreds of apprentices who have been accepted into the UA’s training and upgrading programs.